I am a massive introvert. It is no secret. I will actively avoid any situation that requires too many other people, instead hiding under my duvet until everyone else leaves. But that always creates awkwardness between myself with others. So, imagine my delight when I was browsing Etsy and stumbled across this? I have never fallen in love as quickly as I did when I found this pin by DiglotEtc. This has just the right amount of cuteness and sassiness for the perfect accessory. It also makes my thoughts clear to others straight away. No matter how much fun I’m having, I’m always going to prefer being at home with my cat. 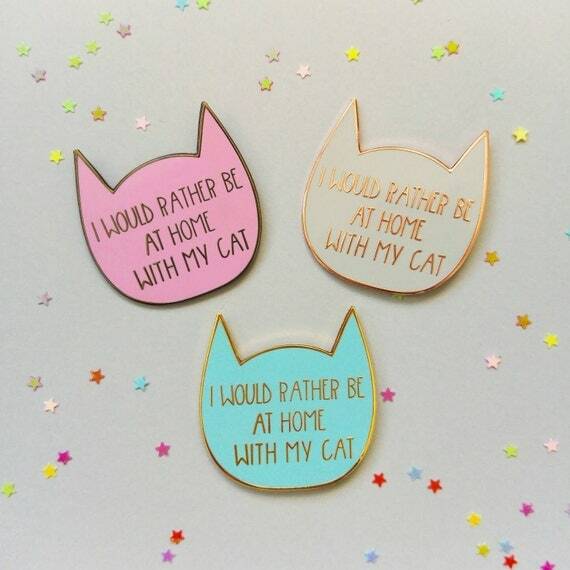 This is going right to the top of my wishlist, so I can wear my introvert, cat loving status with pride. How about you guys? Is there anything you’ve added to your wishlist this week? Comment below! You’re welcome! Now my student loan has come in, I expect I shall be visiting your store very soon!